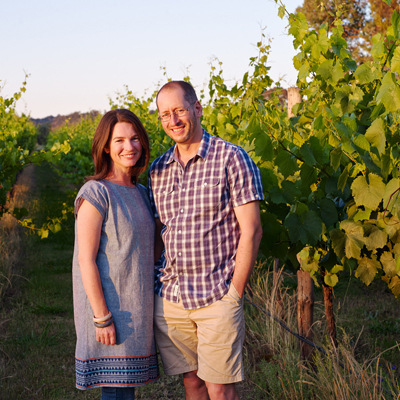 As traditional vignerons, Marc Scalzo and Lisa Hernan have set about planting Chardonnay and Shiraz vines on their picturesque Beechworth property. They are located on the highly sort after ‘golden mile’ amongst some of the region’s most notable wine producers. They focus on making premium, estate grown single vineyard wines. Their wines have a strong sense of place. Rather than impose his own personality on the wines, Marc has always strived to let the vineyard tell its own story. Marc started his wine education around the kitchen table at home. His father Mario introduced him to a wide selection of local and Italian wines. After graduating with a Science degree from Monash University and working for IBM for five years, the lure of wine was strong. Marc then studied Wine Science at Charles Sturt University and has many years of practical experience, including seven years as a winemaker at Brown Brothers and vintages at Giaconda, Seresin Estate (NZ), Delegat’s (NZ) and John Gehrig Wines. Marc is also the Chief Winemaker at Rutherglen Estates. In 1997 Marc planted his first vines with Geoff Simpson at Brangie vineyard in the King Valley. Oliver’s Blend, named after their eldest son and Mario’s Blend, named after Marc’s father are from the Brangie Vineyard. After searching for seven years Marc and his wife Lisa purchased their property at Beechworth in 2003. The Beechworth hills are famous for granitic soils and fine cool climate wines. They have since planted Chardonnay in 2006 and Shiraz in 2008. Sophie’s Block Chardonnay was named after their daughter Sophie who was born the year the Chardonnay was planted and similarly Henry’s Block Shiraz was planted, the year their youngest son Henry was born.